They warned me. They said that when I stop being a stage and start working at the restaurant as part of the brigade, all of the special treatment will end. Today was technically my last day staging and already I could sense things starting to change. First things first. Last week, I officially gave notice at my day job and agreed to a part-time arrangement for the transition period as we recruit and hire my replacement. I would spend Monday-Wednesday at the office and Thursday-Saturday at the restaurant, keeping Sundays off as usual. They are sad to see me go but seemed more or less supportive of my new endeavor. The president’s first counteroffer was, “If this is about the money, that can be remedied…” But they came to realize that this is my chance to pursue my passion, and they thanked me for the time I did spend with them so far. It was bittersweet. When I walked into the restaurant this morning, I wasn’t quite sure what to expect. Station Lead already heard the news from Chef and had Facebook messaged me during the week. He seemed excited that I was joining the team but he teased that I “might be back in the office sooner than [I] think.” He followed up with a “JK” and said he knows I “have a pair” on me and that I am “more passionate than most.” That meant a lot, coming from him. The warm fuzzies were not to last, however. More on that later. I was greeted by Station-mate and he seemed happy to see me. I broke the news to him and he seemed surprised but impressed. He gave me a pat on the back and said that we will make a great team (on our station). Sous Chef S came in shortly after, grinning at me. He told me that when he and Sous Chef J heard the news, they looked at each other and whispered, “Does she know how little we make…?” HAHA. Apparently Chef had to reassure them. I set to work on the prep list. We had a lot to do. 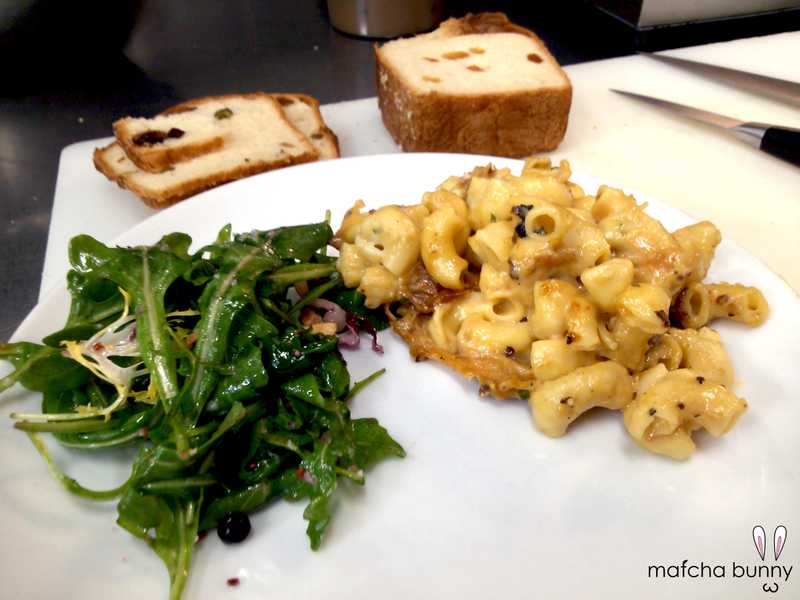 While I was in the middle of slicing cheese, Chef had walked in and flashed me a big smile. “So…?” he inquired. I told him that I spoke to my company and I can start this coming Thursday. His smile grew wider and he said, “Well then, welcome aboard!” More nervousness and excitement. We didn’t discuss the nitty gritty (ie: how much I’d earn and when I would be able to transition to Charcuterie) but for now, this is enough. As a friend mentioned, this whole venture is a huge leap of faith. I continued to make myself useful where I could. 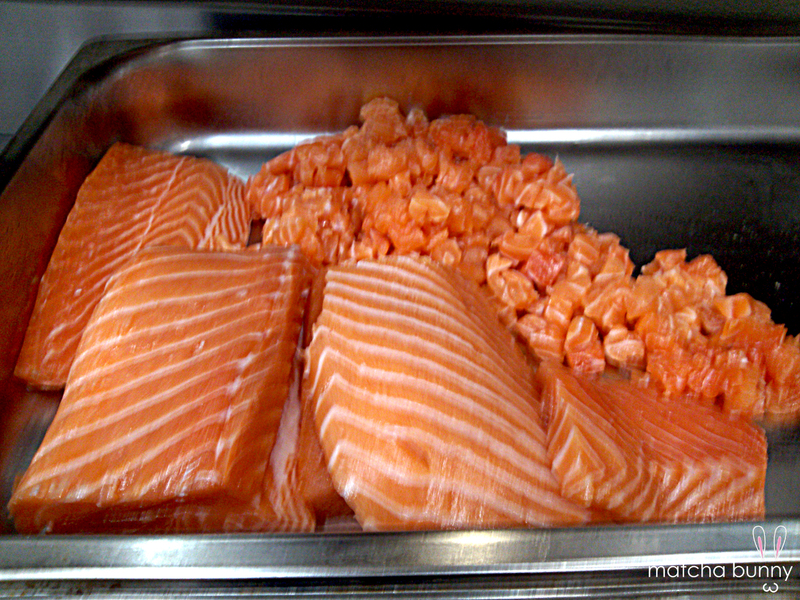 I diced fish again for the salmon and yellowtail tartares. I baked off the bacon slices for our garnish. And, as is my usual tradition, I helped the Sous Chef J with the ravioli. I am looking forward to someday having my chance to work on the hot line so I can make the pasta. So far, this is good practice. But that day is still a bit of a ways off. While I was pinching the ravioli, I mentioned to Sous Chef J that I was unsure of how the guys would react to my working at the restaurant full-time. He said that I was a “cool girl” who can hang with the guys, and that with my passion and hard work ethic, there would be no problem at all. I thought it was nice of him to say. After we broke down and cleaned up our station, Station-mate sent me on my way. I went upstairs to the office where I found Station Lead, Chef, and the executive chef of Chef’s other restaurant all chatting. Chef referred to me as “one of the crazy people who give up a well-paying job to become a commis” (French for “cook” or “chef”). That other executive chef’s last interaction with me was at that food event during my second week ever as a stage, so he seemed a bit perplexed but intrigued that I decided to pursue this full-time. 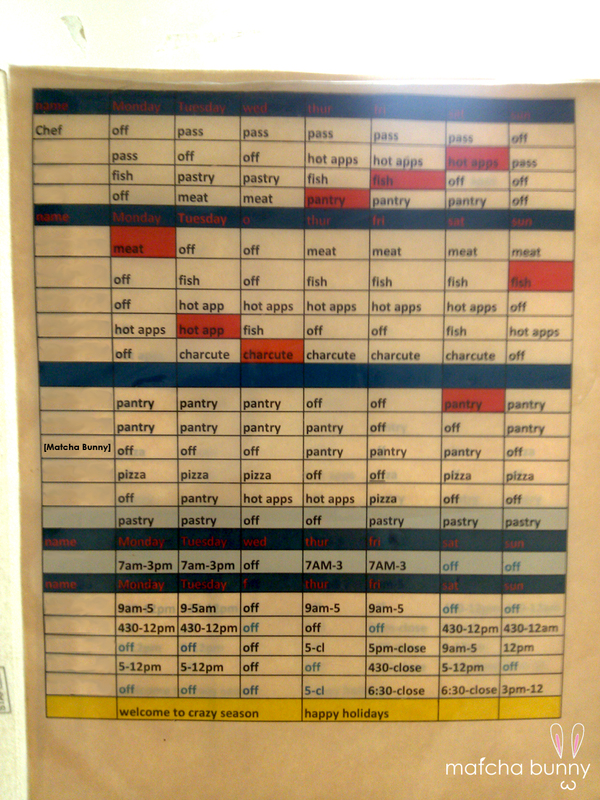 They printed out a new schedule and I was pleased to see myself included and with three (count ’em, THREE) shifts. It all still feels surreal, but I think it will finally sink in on Thursday morning when I step into the restaurant and don my apron instead of sidling up to my computer at the office. This entry was posted in Staging and tagged chef, cooking, food industry, professional kitchen, restaurant, stagiaire, staging on January 5, 2014 by Matcha Bunny. Today’s prep list was not very long, but it consisted of the most annoying and tedious tasks (super fragile crouton “rings,” for example). 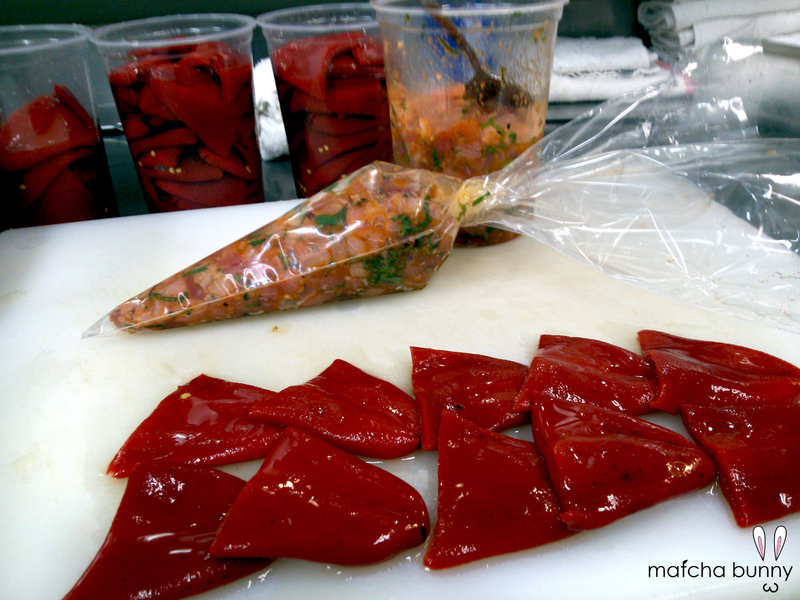 Luckily, I got to try and learn something new — dicing up fish for the two tartare dishes. After the crash course in fish butchery last week, I felt more comfortable with handling the gorgeously marbled salmon loin and two sides of hamachi (yellowtail). Station Lead let me borrow his knife again, with its super thin but very sharp Japanese blade. So cool. I really appreciate that they let me do the dicing (a task where even if I mess up, it’s not a huge deal). Gotta start somewhere! No sooner had I put away the last of the diced hamachi and washed my fishy hands and cutting board did a surprise come a-knocking. Pastry Girl called over and said “people” were here to see me. My parents, cousin, and Honey Bunny were standing there, a bit hesitant to enter. I invited them in, gave them a brief tour and introduction to everyone, and went to find Chef in the walk-in. He seemed excited to see them and was very surprised to receive the pomelo. My mom had the foresight of cutting one up for them to try, and everyone in the kitchen eventually made their way over to taste the strangely dry white grapefruit. It was amazing to observe as Chef, Station Lead, and the Sous Chefs brainstormed ideas on how to use this unique citrus in various dishes, pickling and marinating it as a vegetarian “fish” because of the way it flakes. They even joked (?) about placing an order from my parents. Haha. I had Charcuterie Guy come over to meet my dad and he manned up and shared his own Vietnamese banh mi style pickle with my parents to sample and critique. Good times. After a brief visit, they said their goodbyes and we all got back to work. I teased the Sous Chef that they were all on such good behavior for my family, to which he immediately retorted, “Of course — don’t want to piss off the Yakuza.” HA. I thought that comment was hilarious (and a bit racist). A few of the other guys continued to remark about how delicious the fruit was. 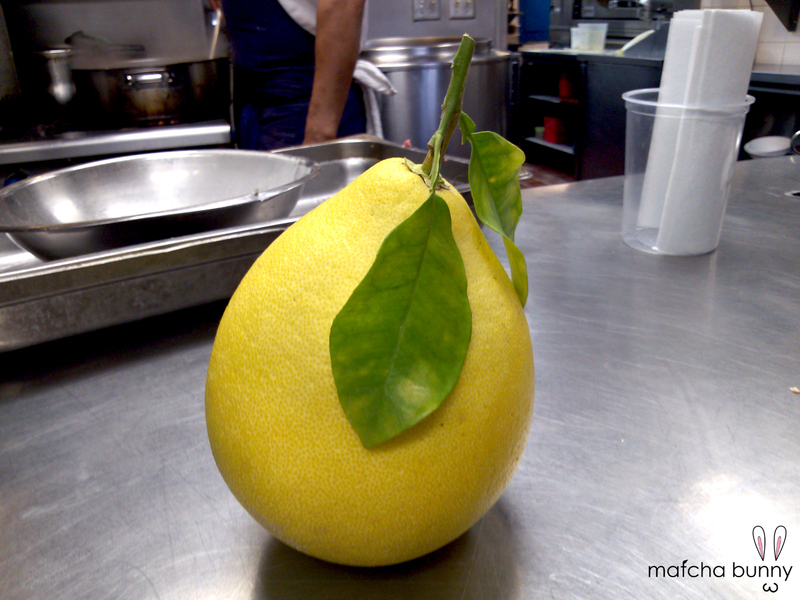 One said that when he first saw it, he thought it was a giant yuzu. “It looks so little in the picture on the bottle!” he insisted. I laughed so hard, but he is right — it looks exactly like a monster-sized version of the Japanese citrus. Just before service began, Chef took off. I later learned that he had had a hernia for a few weeks now but refused to take time off because of the holiday rush. “The man is a beast!” people said. He breezed past us as we huddled outside, eating our humble dinner. No one got sick from family meal this time. In fact, it was really really good. The meat really resembled the Chinese rotisserie sides of pork that hang in the windows of BBQ shops (heo quay, in Vietnamese). I wanted to go back for seconds but I knew that I would then just want to lie down and take a nap afterward. Instead, I went inside and checked on the tickets that had already begun to print. One of the tickets on order was for a happy hour portion of oysters on the half shell. Usually Station Lead jumps at the chance to speed through the process as though he were a competitive oyster shucker, but since he and Dishwasher-Turned-Pantry Guy were outside, I went ahead and handled this order. I don’t usually get the opportunity because though I can do it, my inexperience means I’m slower than they would be. Sous Chef was manning the pass tonight in Chef’s absence and he peeked over to see if anyone was paying attention at our station. I think he was a little surprised to see me shucking and even more so when I delivered the completed order to the pass. Three oysters proudly resting in a bowl of crushed ice. A small victory but I’ll take it. Service was sadly slow-paced today, although we had an especially long lull because of a printer malfunction (someone had unplugged it so we were not getting any tickets for about 20 minutes or so). A bit of panic set in as we fought to catch up, but then it was smooth sailing after that. Station Lead and Dishwasher-Turned-Pantry Guy took frequent cigarette breaks, leaving me to make the occasional salad and help with the Pizza and Charcuterie stations. Pizza Guy taught me how to toss pizza dough — holding it as though my hands were paws (hilarious because of his nickname around the kitchen… ask and I’ll tell). I got a nice turn off my wrist but it was hard to catch it properly. I’ll definitely have to keep practicing. Using my dough, we made a pizza for the guys to snack on — chicken, bacon, ranch. Yum! Charcuterie Guy told me that he is planning to leave mid-January. He found a gig with a chef he used to work with and it’s a great deal — a salaried position as a Kitchen Manager / Executive Sous. He’ll have normal hours, decent pay, time off to spend with his son…. the only downside is that he would no longer be cooking regularly (mostly overseeing). I’m going to be sad to see him go; he’s been one of my best friends in the kitchen. Maybe we bonded after that booty slapping incident; that joke is still widely told among the guys today and they never stopped teasing Charcuterie Guy for it. Hahaha. Oh – I almost forgot to mention. This year, I really wanted to be one of those people who made cute little homemade gifts in jars. So last night, despite fighting a mad allergy attack, I pumped out a dozen jars of satsuma mandarin marmalade and left them at each of the guys’ stations this morning. They seemed super excited for the Christmas present and there were lots of hugs all around, even from Pastry Girl (need I reiterate the importance of being on Pastry Girl’s good side?). I love being part of this kitchen and can’t wait to see what 2014 has in store for me. Ciao~! This entry was posted in Staging and tagged chef, christmas, cooking, food industry, holidays, parents, professional kitchen, restaurant, stagiaire, staging on December 29, 2013 by Matcha Bunny. “I’m Jewish, you insensitive jerk,” was some guy’s reply to Station-mate, who was regaling us of his hilarious cautionary tale to wish people “Happy Holidays” instead of “Merry Christmas” in order to be politically correct. 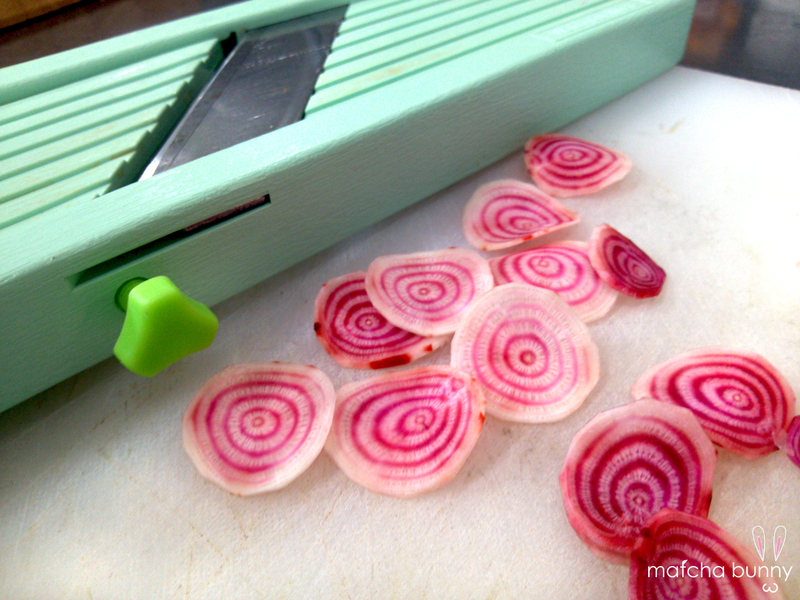 Shaved Candy-Striped Beets – aren’t they cool? Today was hectic but fun. Chef finally got to take a break for the holidays after apparently working for 32 days straight (according to Facebook), so the overall atmosphere was more relaxed and carefree. It was also a bit bittersweet as today was the last day I would get to work with Singing Hot-Apps Guy, who is moving on to another kitchen. (By the way, it has been brought to my attention that Hot Apps Guy could be misconstrued as an Appetizers Guy who is physically attractive; thus, I will be hyphenating “Hot-Apps” from now on.) But everyone was in an especially jolly mood with the approaching holidays! I brought in a box of holiday toffee from TNT Toffee in Hermosa Beach to share (a gift from my day job). I opened up the package and left it on the table upstairs in the office where everyone has to stop by to at least pick up their aprons. As it turns out, everyone really liked it but had no idea who had brought it in until I asked someone if they had a chance to try it. Between all of them, the one-pound box had disappeared within the hour. Just in time to devour the doughnuts brought in by Catering/Events Girl. I know I mention coffee on many occasions, but did I ever mention that we make ours in a pot? The first person to come in tosses coffee grounds and water into a stock pot, brings it to a boil, and strains it through a filter-lined chinois. The moment it is ready, just about everyone in the kitchen flocks over, plastic quart container in hand and fighting over the ladle. That’s right — we ladle our coffee out of a stock pot. I suppose it is the best way to make enough coffee for 15 caffeine fiends. 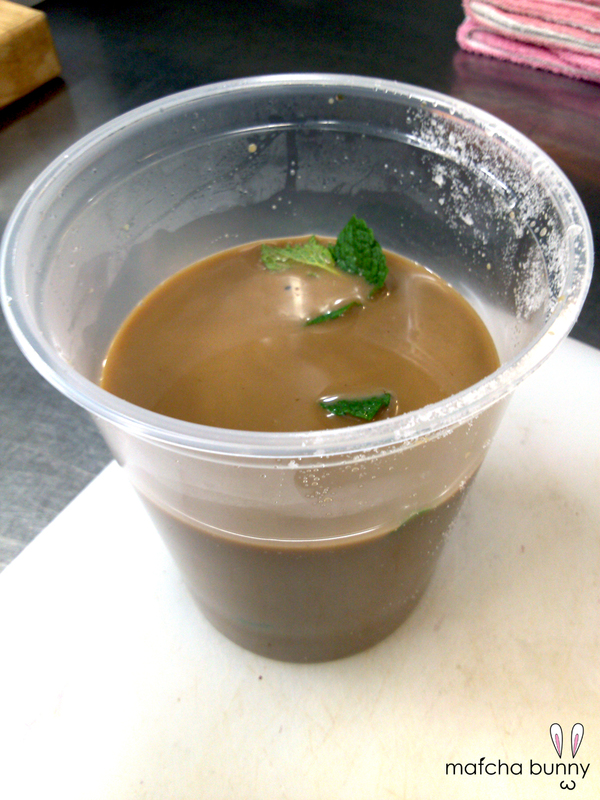 Singing Hot-Apps Guy suggested steeping some fresh mint so I gave it a shot. When Station-mate looked at it, his eyes widened, and he whispered to me, “Hey — someone put green sh*t in your coffee….” HAHA, I love peppermint tea, so I thought it was pretty delicious! The prep list was light today and according to the guys, it was the first night in weeks that there was no party on the books. A huge relief for us. I knocked out a handful of the items and Station Lead invited me to his cutting board for a crash course in fish butchery. He had worked at a sushi restaurant for an austere Japanese chef for years before working with Chef, so he knew his stuff. He broke down a whole loin of salmon and one of yellowtail in mere minutes. It was awesome. I love his knives too — I am definitely saving up to add a thin-bladed Japanese knife to my kit. I was reminded of how much I love this kitchen when I observed how everyone chips in to help each other and run like a well-oiled machine. While our prep list was light, Singing Hot-Apps Guy had unintentionally prepared a batch of gnocchi dough using 6,500 grams (14 pounds!) of potato. Over twice the size of a regular batch, this meant it also took twice as long to cut and roll. Since he had to spend more time on this task, it was already 4pm or so before he was barely able to get started on ravioli. He had to move his operation over to Pastry Girl’s area, and the two Sous Chefs and I helped him out, assembly-line style. With four people tackling the ravs, we finished in no time, but not without some chitchat and joking around. Pastry Girl made a lewd comment that took one of the jokes way too far, but then she turned back and declared that, being female, she and I were the only one who could make a comment like that. I rushed back to the Pantry station to find that Station-mate had gotten a plate of family meal for me — a generous pile of food that included deep-fried gnocchi. Chewy on the inside, crunchy on the outside, it’s like an awesome doughy tater tot. After all the snacking throughout the day, though, I didn’t really eat much of it (a good thing — I’ll elaborate later). Service started with a bang and there was a steady flow of tickets throughout the night, with 120 on the books and many walk-ins on top of that. Charcuterie and Pizza got slammed early on, so Station-mate and I split up to help them. It got tense in the kitchen, and one of the Sous Chefs completely flipped out on Pizza Guy for being late on a ticket and then delivering a burnt pizza (“Too much character,” Station-mate calls it). A lot of yelling and arguing… it’s just like in the TV shows. When it was fish, meat, and pasta’s time to feel the brunt of the rush, I noticed that Charcuterie Guy was working on a Vietnamese-inspired pickle. He asked me to taste it and give some feedback, and when I told him about how my dad made similar pickles, he got really excited and asked me to text him a recipe. So Dad — your ideas might star on our menu in the near future! Shortly after we made it through the halfway mark, Station-mate wasn’t looking so good. He said he felt like it was food poisoning and that he needed to go vomit (sorry, TMI). We tried to think back on what it could have been… he and I had both eaten a lot today and many of the same things. Except one. One part of family meal was made of leftover leftovers, and I didn’t really like it so I ate around it. He apparently scarfed it down, and it was at this point that we saw a few other people feeling pretty bad as well. I told him to go get some air and I helped carry our station through the end of service. 10 o’clock rolled around and after cleaning up and breaking down our station, we went outside to hang out and unwind. The others trickled in and out, exchanging hugs and well-wishes for the holidays. Someone even shared sips of mezcal (a distilled liquor similar to tequila). More than one person mentioned that there would be Christmas gifts forthcoming, which made me feel a bit better about my belated gifts (I am planning to make everyone gifts but was not able to finish them in time to bring today). I am so thankful for this second family that I’ve had the pleasure to work with each Saturday for the past four (four!) months. This entry was posted in Staging and tagged chef, christmas, cooking, food industry, holidays, professional kitchen, restaurant, stagiaire, staging on December 22, 2013 by Matcha Bunny. So having seen that picture on Facebook, I made sure to arrive early today anticipating that they would have used up most of the mise and that we would have a lot of prep to do today. The only people in the kitchen were Morning Prep Cook, Morning Dishwasher, and, to my surprise, Station-mate! I hadn’t seen him in nearly a month since he started getting Saturdays off. I went to get my cook’s shirt (the shirts, by the way, hang up high in the teeny tiny kitchen bathroom) when a very embarrassed New Guy walked in on me. He was a new stage (today is only his second day) and he worked at another restaurant with New Hot Apps Guy. New Hot Apps Guy suggested that he come check out our restaurant to get some experience while he attends culinary school. I told him I am a stage as well, to which he immediately, without skipping a beat, replied, “Oh, are you on Pastry?” …….. Just because I’m a girl, I thought to myself with a mental eye-roll. I went up to grab my apron and shoes before running back down to check the prep list. I was pleased to see that it was relatively light! They really overcompensated for the parties so there was plenty of leftover mise. It also seemed that everyone who worked Friday night was planning to come in late today. The next person to walk through the door was Fish Guy, and we all shared a laugh over how all the Asians were there earliest. The guys had me segment oranges again, so I started with that. The guys started to trickle in, and I got some happy greetings and high-fives out of them. Have I mentioned before that despite coming in only once a week, the guys are often making the same jokes and singing the same songs as the last time I saw them? I actually kind of like it because it feels like I don’t skip a beat or miss out on much. I laughed so hard as one of the guys reminded me of Charcuterie Guy’s misappropriation of Shakespeare from last week (“A rose by any other name is still a rose,” says he). 5 o’clock rolled around and family meal was served! Fish Guy spent all day smoking some chicken. He knew everyone (myself included) was getting sick of chicken, so he decided to smoke it so that it resembled pulled pork. 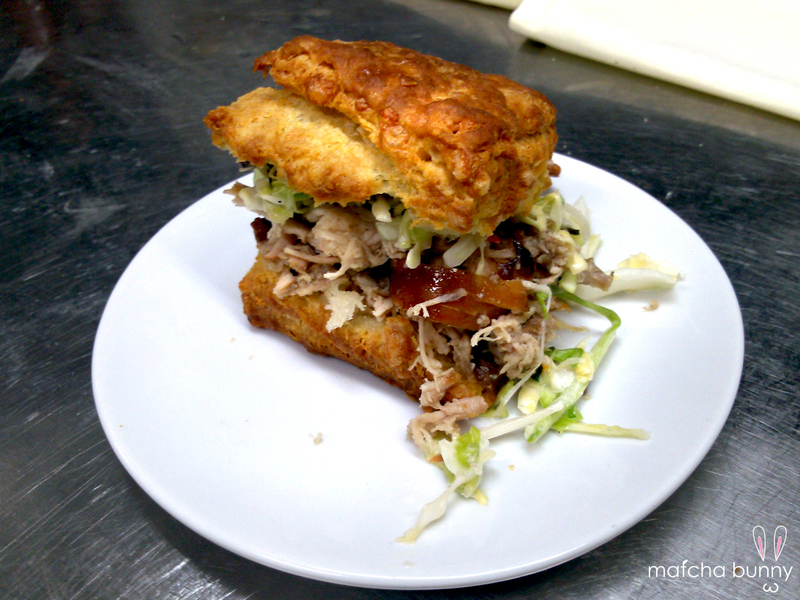 Piled onto homemade biscuits and topped with a dollop of coleslaw and it was awesome. I ate three biscuits. One of the Sous Chefs ate six. We definitely needed the nourishment to push through this evening’s rush. The tickets printed in a steady stream, and in addition to a busy restaurant, we had a 30-top of passed hors d’oeuvres and a 14-top that booked a six-course tasting menu. Tasting menu? I didn’t even know we did a tasting menu! It was intense. When the Expediting Sous Chef fired one of the courses, everything was put on hold and our entire station was cleared off to accommodate the 14 plates (or bowls). But service could not just stop, of course, so while some of us rushed to plate the tasting menu, one or two of us would continue handling the tickets on our board, taking over other nearby stations for precious counter space as needed. In a word: insane. Tonight was really all about communication and lending a hand to keep stations from being in the weeds (falling behind). I stepped over to Charcuterie to help with the salumi plates. Former Dishwasher and I garnished pizzas as Pizza Guy pulled them out of the 600-degree oven. Charcuterie Guy came over to help plate the quail. He was on our station cutting and serving up the sunny-side-up quail eggs on each of the 14 plates… and he subsequently stabbed my knuckle with my own paring knife as I was reaching to get something. Poor guy, he apologized profusely. It’s no bigger than a paper cut, but it definitely startled me. I’m slowly earning my battle scars from the kitchen. haha. This entry was posted in Staging and tagged chef, cooking, food industry, professional kitchen, restaurant, stagiaire, staging on December 15, 2013 by Matcha Bunny. It rained today. Walking out to the back fridge in the rain was not so fun (yes, we have a separate walk-in refrigerator to store all of our extra produce… it’s also where the kegs feed into the bar taps for draught beer). Actually, walking back with a plastic bin full of cauliflower and cucumbers was probably these worst part, since on the way there, I was able to use the bin as a makeshift umbrella. The only thought in my head was man, I haven’t been sick in years but if it’s going to happen this year, it will be because of this moment. Luckily, that first trip was my only venture into the rain, although the bracing wind did flow in through our screen door and flood the kitchen with cold air throughout the day and night. Today I got to use the recipe book and prepare one of the dressings. That means I actually got to cook – yay! My assignment was cauliflower dressing, which bore a surprising resemblance to the soup. My station lead said he wanted me to do more than just slice vegetables and I appreciated the opportunity. As it turned out, today was not just about making dressing. It was about reading the recipe, structuring a plan of action, assembling my mise en place, selecting the appropriate equipment and tools, applying the techniques I learned (from prior knowledge and from working here). Staying organized was key. I started the garlic confit over on the hot line while I chopped up the cauliflower. Then I moved the setup over to the back stove so I could cook down the vegetables with the garlic. As I stood stirring, people would call out to me to ask about the status of their pots, which took residence over the other 5 burners. “Is my cream boiling over?” asked Pastry Girl. “Can you turn down the heat on mine?” shouted Fish Guy, whose pressure cooker was whistling like a tea kettle. I love the hustle and bustle of a busy prep day (even if that means that the Vitamix blender I need to use has a waiting list). During the pauses when we had an empty board, Station Lead would go outside for a smoke break and Dishwasher Turned Pantry Guy would goof off somewhere. (This was the third Saturday in a row that Station-mate was off, and I’m beginning to suspect that it’s because Chef knows I will be here to help.) I noticed that Charcuterie Guy was slicing a new item for the salumi / cured meats plate and went to check it out. 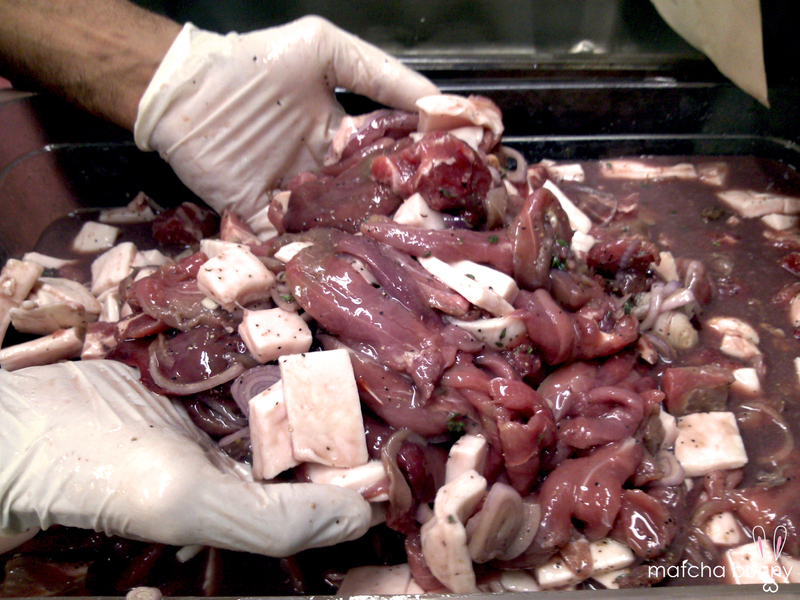 Duck prosciutto (pictured above). 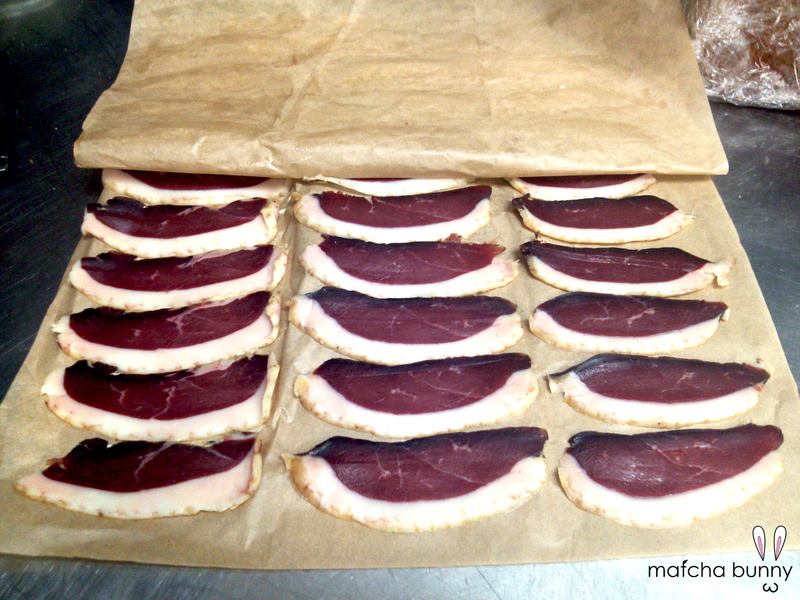 Thick duck breasts brined and cured in a similar style as the Italian ham, these were made in-house, as are all of our charcuterie items. And man, are they good after being lovingly cared for over the past two weeks. It seems that Hot Apps Turned Fish Guy is doing well, so Fish Guy was more of a floater, helping out where needed throughout service. He ended up hanging around us, joking around with some literal and figurative rib-jabbing. He likes to mess with people, so he would occasionally sneak up on me and jab me right between the ribs. (This is the same guy who surprised me with a ninja kick that made my knees buckle under my own weight… I think on my second day.) I didn’t get special treatment though; he also whacked Pizza Guy and Charcuterie Guy with towels just like those locker room towel fights I would see in movies. Charcuterie Guy reaffirmed my initial suspicions — this is all a part of becoming truly accepted as “one of the guys.” So while my rib muscles still ache a bit, it feels bittersweet. We cleaned up and scrubbed down early, so I went upstairs as usual to get my things from the Office. Chef was there, along with Station Lead and Catering Girl. I ended up staying for the conversation. They were mainly commenting on how unusually slow it is right now and that the trend seems to be affecting the restaurant industry as a whole. Chef mentioned that he would hate to have to fire hardworking people just to cut costs and hopes it doesn’t come to that. They shared stories of Christmases past, including tales of ridiculous catering orders that were nearly impossible to accomplish. As the conversation was winding down, Chef started to change into his regular clothes when he looked at me straight in the eye and said, “I’m going to change my pants now, so you can either leave, turn away, or see me in my underwear.” (Again, you have to imagine this in a British accent.) I thanked him for the warning and said I’d see him next week, chuckling to myself as I headed down the stairs. 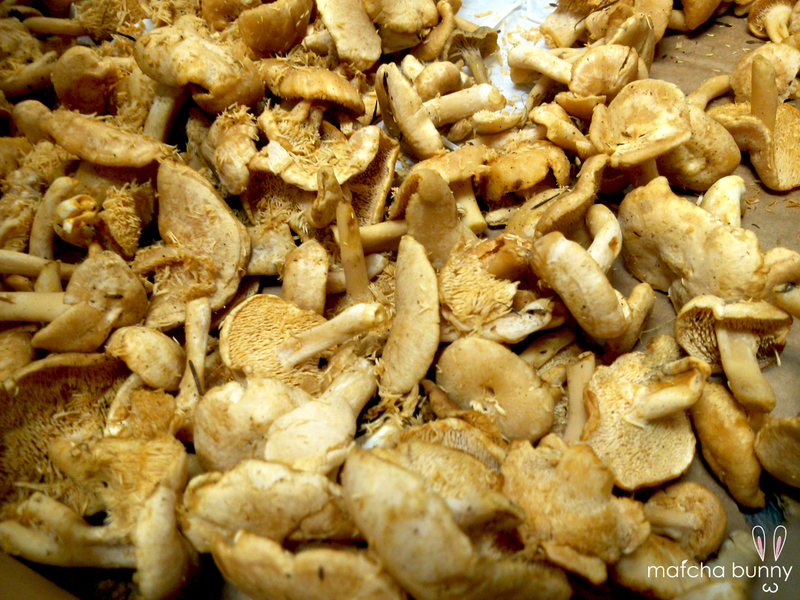 This entry was posted in Staging and tagged chef, cooking, food industry, professional kitchen, restaurant, stagiaire, staging on December 8, 2013 by Matcha Bunny.